A couple of trappers are on their way back to town with something large in a crate. They stop to rest and end up getting mangled by a giant white furred monster. One of them manages to get back via dog sled. His dying words spark the interest of a local business man who is looking to profit off having an actual Bigfoot on display. He and his goons make a few attempts to capture the monster, accidentally shooting its child in the process. 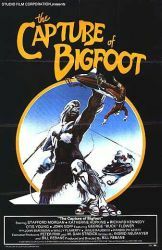 The sheriff and a young boy also make attempts to contact the legendary creature known as Arak.